The growth of mobile devices has already led to a significant rise in network attacks on wireless networks. With the recent wave of attacks like Shellshock, WireLurker, and now DoubleDirect, security professionals are predicting that 2015 will be the year previously undetected mobile attacks go mainstream. Hear from mobile security experts Zuk Avraham and Patrick Murray as together they explain how a mobile device changes the threat landscape forever. Learn how unsecured mobile devices provide a new entry point for hackers looking to infiltrate and compromise an organization. 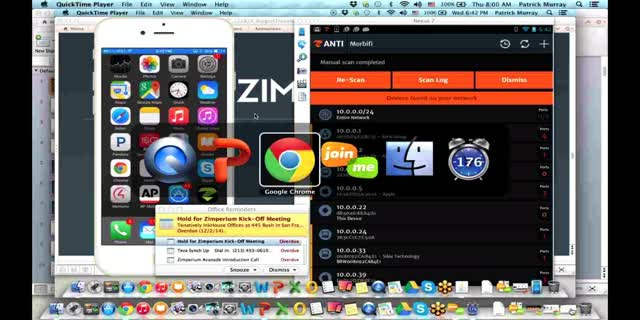 Zuk will dissect DoubleDirect, a new attack technique recently found in the wild by the Zimperium Security Labs to show how an iOS and Android device can be silently attacked. Patrick will share best practices to help modern enterprises securely embrace mobility initiatives for 2015 that support productivity, protect the corporate network and respect user privacy. This webinar discusses mobile device security fact vs perception. We will dive into the findings of a recent mobile security research study of over 1,900 cybersecurity professionals’ perceptions on mobile threats and contrast these opinions against mobile threat realities from Zimperium’s Global Threat Report, with real-word data driven from millions of licensed mobile endpoints around the world. ● The latest mobile security perceptions from Information Security’s 2017 Spotlight Report. ● Mobile risk and threat realities from Zimperium’s Global Threat Report, with data driven from millions of licensed mobile endpoints around the world. ● Detailed descriptions of device, network and application attacks and vulnerabilities, along with brief recommendations of how to prevent and remediate each. Join this presentation and experience what a mobile attack looks like from the viewpoint of the victim. Get insight into the complete process of a man-in-the-middle Wi-Fi attack. This talk will cover a specific attack which took place at Dallas Fort Worth International Airport on AT&T Wi-Fi while a business traveler was waiting in terminal A for his flight. The presentation will examine details of the attack, including how the wireless carrier rerouted the user's personal wireless traffic from an LTE network to Wi-Fi. You will see exactly what the user experienced on his device and all of the correlating events that took place during and after the attack. All of the detailed forensics and threat data are provided in this presentation to give you an understanding of the exact data provided to the security team. Controlling and protecting smartphones and tablets and the applications they run is an important part of the extended endpoint protection environment. Endpoint security is vital, and you need to treat your mobile endpoints with the same urgency as your Windows and server endpoints. Join Zimperium’s latest webinar featuring Ovum’s Andrew Kellett. Andrew and John will discuss the importance of adding mobile devices to your endpoint security procedures and how to detect attacks via mobile OSs, applications, malware and Wi-Fi networks. Zimperium provides real-time on-device threat defense against device, network and application threats to both devices and applications. This channel provides details on how to secure your mobile devices and applications from cyberattacks.